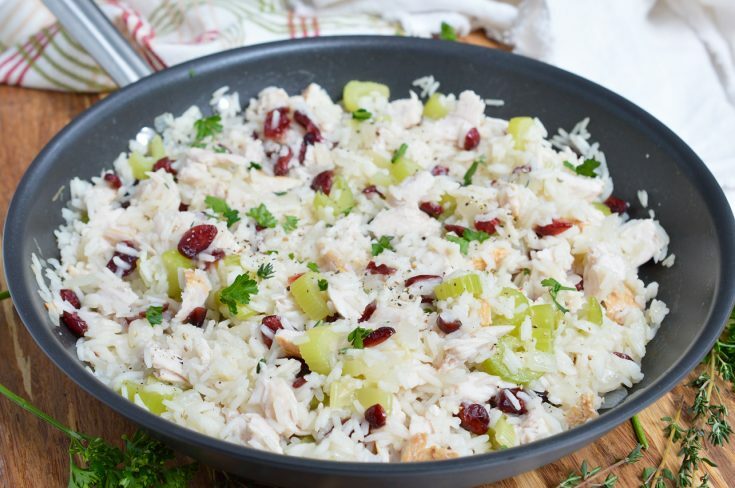 This Turkey Cranberry Rice is great for using up that leftover Thanksgiving turkey. 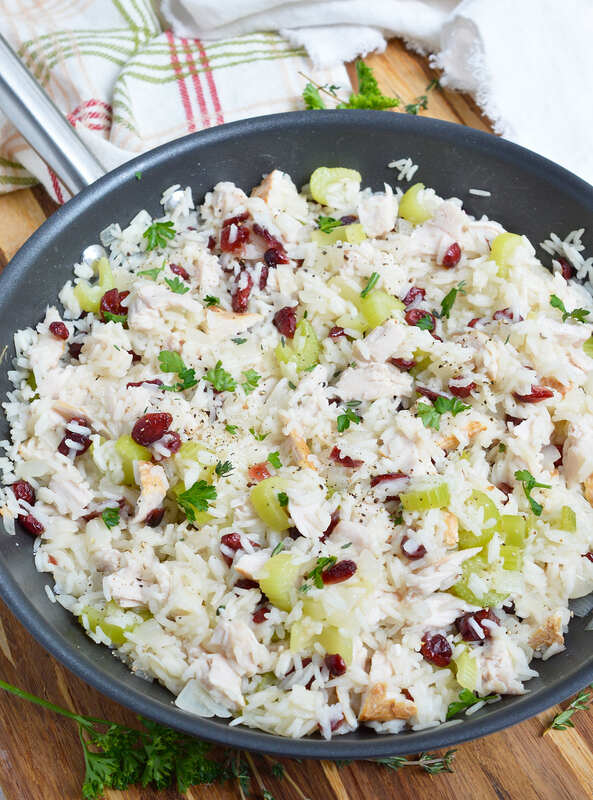 All of the holiday flavors come together in this easy one-pan dinner recipe! I’m usually all about an after Thanksgiving sandwich piled high with leftovers. But, sometimes I like to change it up and do something different. 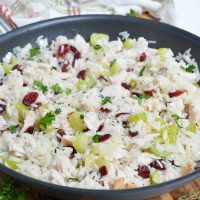 This Turkey Cranberry Rice is great for using up that leftover turkey after a long day of Black Friday shopping. And since most of us don’t even want to think about washing another dish the day after Thanksgiving, this is a one-pan recipe! Mix it up, let it cook and serve it hot. Turkey day reimagined. Try these Thanksgiving Leftovers recipes from around the web. . . In a large skillet over medium/high heat, sauté onion in olive oil for 4-5 minutes or until almost translucent. Add celery and cook 2 more minutes. Add rice and 2 cups broth. Bring to a gentle boil, cover and reduce heat to medium/low. Cook 10 minutes while stirring occasionally. Check doneness of rice. If needed, add 1/2 cup broth and cook 4-5 more minutes. 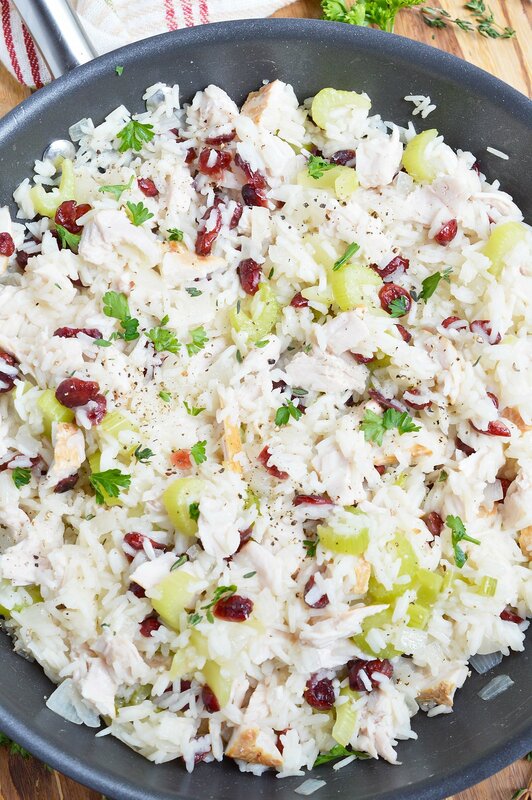 Once rice is almost to desired consistency and there is still some liquid remaining, add turkey and cranberries. Cook covered for 2 minutes to heat turkey. Salt and pepper to taste. Top with fresh herbs and serve.